As noted in my earlier post, spent the last two days up at Oracle OpenWorld, mainly focusing on how they were presenting their offerings that are being hung under the "Social CRM" banner. 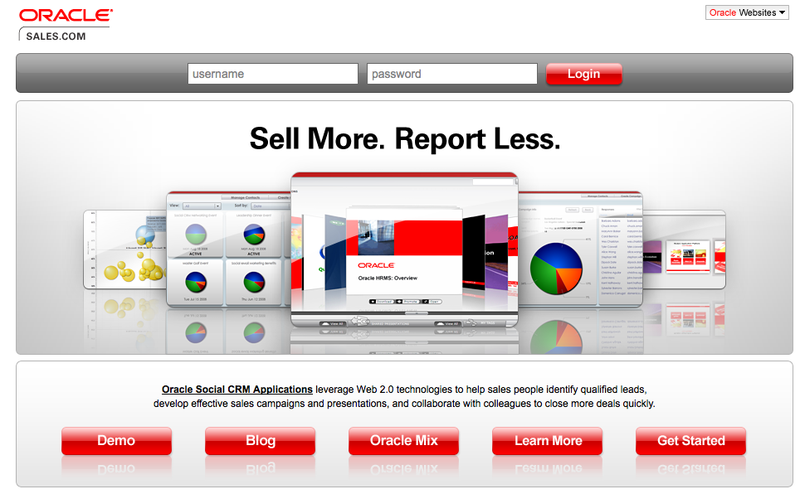 "Oracle Social CRM Applications leverage Web 2.0 technologies to help sales people identify qualified leads, develop effective sales campaigns and presentations, and collaborate with colleagues to close more deals quickly." kitson: #oow08 #Lye "With Social CRM, the individual gets a benefit, the network gets a benefit, and the company gets a benefit." kitson: #oow08 #Lye "Oracle is a beta customer for us." 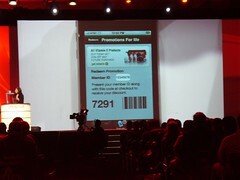 kitson: #oow08 #Lye "Marketing has a very serious role to play in Social CRM." [cited the Body Shop iPhone app:] "The always-on loyalty program." their time actually selling…. &they really don’t like CRM"
kitson: #oow08 #Lye "I don’t like ‘CRM 2.0’ because someone’s going to come up with ‘3.0’ and ‘4.0’ Versioning a strategy is flawed." kitson: #oow08 #Lye "Maybe there are a few companies that live off their own successes–but that’s really a small percentage now." 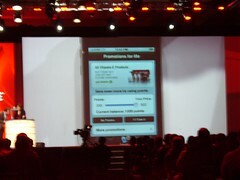 kitson: #oow08 #Lye "I don’t expect to sell this [Social CRM] to everyone." kitson: #oow08 #Lye "Fear is always a good thing, I think. Businesses don’t do anything unless they’re afraid [of the alternative]." kitson: #oow08 #Lye "Taking the best of the consumer Internet and enterprise data to leverage what’s already working with what Oracle can do." kitson: #oow08 #Lye "The nicest compliment everyone pays me is how ‘un-Oracle’ Social CRM is." kitson: #oow08 #Lye "Social networks can be public, they can be private, and they can be secret." kitson: #oow08 #Lye "What we’re doing in our Social CRM is we’re bringing in ERP data + CRM data–data sets you’d NEVER put on the public Internet. want 2 converse & CRM systems have no idea what’s going on." kitson: #oow08 #Lye "CRM for the first 10 years was about data capture." So, it’s appears clear that Anthony Gets It with respect to what the right things to say are. Now, just to turn the Sayonara around to embrace the customer as relationship partner is the task at hand and exhibit that understanding via product, positioning and action. 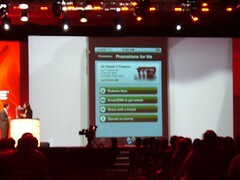 The other bright spot was a proof-of-concept demo that was shown for customer The Body Shop. This was an iPhone application that started to inch down the path to giving more power to the customer, or at least include her in the relationship at some level. 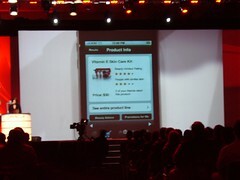 Here are a few quick shots from the keynote. Here’s an entry-screen to the application, which a customer could bring up on her iPhone when she walked into the store. Behind the scenes, profile information on preferences and purchase history would be available. Oooh! Product! The sort of nifty thing here was access to ratings of this particular product both from the "at large" community, as well as the specific ratings from your "friends" and/or "people like you." A hop over to a "loyalty card points" page, where points could be redeemed for discounts, etc. Choose from one of a bunch of options for the "loyalty" bonus: Redeem Now, Email/SMS to get Rebate, Share with a Friend, or Donate to Charity. Ok, we chose "Redeem Now." Discount code is available, take the "coupon" to the register to save a few bucks at checkout. What I was NOT able to get were any details on how "real" the application is. The demonstration that was shown was very, very scripted, and quite a bit of the demo required the suspension of disbelief once you started to delve into the details. For example, the details around the explicit sharing of a lot of (really) personal data among "trusted" friends was assumed to "just work," with neither the social nor the technical nor the identity underpinnings given any level of discussion. Another big thing to note: the access to purchase history and preferences and the like is wonderful, but the information still is 100% in the hands of the vendor. So, although some of the ideas feel a bit like VRM, the implementation still needs to take the big leap – let the customer control, edit, change, and manage her own data. That part is still most definitely not there. We still have the silo problem – if you had one of these apps for The Body Shop, and one for the movie theater, and one for the restaurant down the street, we’d still have the Tower of Babel problem we have today. Of course, it would just be a shinier Tower of Babel, since it’s on the iPhone. The customer really is in going to be in control. Deal with it. Thanks for this – the excellent report and analysis was very informative and useful. Thanks for your insights on the state of the market place. Yes, consumers have unprecidented ability to collaborate with companies – if the companies are willing and have the technical support and integration to make it happen. Isn’t having a customer tell you what they want to buy a good thing? Hmm. Might have to change your products to meet market demand. Business basics will get easier when we get over some of the privacy issues to provide high value customer experiences and access. Good post. Believe me when I tell you that we get The Customer Manifesto. Give us time. You’ll see some inroads for the customer soon from us. Take a look at our blog from time to time (blogs.oracle.com/socialcrm). Obviously, we can’t post things we are working on, but what we do talk about on the blog are what is publicly available or shipping soon. >> Do you mean The Cluetrain Manifesto? >> Do you understand that the Manifesto deems transparency a crucial component? Oracle is leading the way everyone!